Etna Diemecke, attended the January 2003 Suzuki International Festival in Lima, Peru, as a scholarship recipient. She returned to Guanajuato, Mexico, determined to organize a similar event there and she did it! Thanks to the seeds already planted by Sandy Reuning and the Ithaca Suzuki Institute, and the generosity of the donors to our Latin American Teachers Scholarship Fund, the 1Sl Suzuki Festival of Guanajuato took place in September, 2003. This was the first such event ever in Mexico. Three years ago the Ithaca Talent Education Tour Group gave concerts in Guanajuato, Mexico and some nearby cities and was hosted by the School of Music at the University of Guanajuato. This introduction of Suzuki Method to a number of violin teachers resulted in a continuing relationship between Ithaca Talent Education (ITE) and the group in Guanajuato. For the last three summers teachers from Mexico have come to the Ithaca College Suzuki Institute for short term training, and returned to Mexico highly motivated to put Dr. Suzuki’s philosophy and method into practice. In the short time of just three years, under the directorship of Etna Diemecke Rodriguez, the Festival Guanajuato (Institute!) took place in September 2003. My role was primarily teaching the Book One violin course, which had 15 enthusiastic teachers, enrolled. My daughter, Carrie had prepared the “pre-twinkle” section of the course before I arrived. We took four violin and four cello students from ITE along for demonstration purposes. I felt that any young, developing program could benefit from the model of well-prepared advanced student musicians. These wonderful young people brought music to life such as Bruch Concerto, Bach Solo Partitas, Breval Sonata, etc. in daily recitals. They participated along with the Book 1-2 violin class and helped out with teaching and with demonstrating in the teacher courses. This wonderful exchange was very helpful to the Mexican students, teachers, and parents in understanding the wonderful potential of Suzuki study. It was such a gift for those students and all of our teachers to be able to share with the wonderful families in Mexico. The future looks bright for the continuation of Suzuki activities in Guanajuato and surrounding communities. Teachers and families with students will be back at the Ithaca College Suzuki Institute this summer, and we will be back in Mexico in September working with more teachers and students! What must have Dr. Suzuki have felt like to come to the U.S. in the 1960s and find so many people who understood his vision that every child can reach closer to his or her potential through music and respect? After my trip to Mexico in September 2003, I feel a little closer to knowing. My job in Guanajuato was to train violin teachers (Unit lA) and to teach the children who were studying violin in the established Suzuki programs in the region. What I didn’t know that I would find was that within these fledgling programs are teachers and parents that hold Dr. Suzuki’s vision- understanding it and wanting to do whatever it takes to offer this music and respect to the children of Mexico. Much of the time I was moved to tears as I witnessed music cross the boundaries of culture and language. I look forward to an ongoing relationship with all I met. I am as changed as they are. Laura Jauregui de Campero traveled from the United States to participate in the festival. Having lost my father in June of 2002 to heart failure, I have been on a quest to find the true meaning of life, and what it is that I was destined to do. Attending the I Suzuki Festival in Guanajuato, Mexico was like all the paths and truths in my life converging. Still to this day I tell people it was because of my father that I studied the violin at the age of five with the Suzuki Method and the fact that my father was from Mexico City made this particular teacher training course in Mexico very meaningful to me. It was because my father was from Mexico City and it was he who insisted I studied the violin, that I felt an incredible force telling me to do everything in my power to attend the first ever Suzuki Festival in Guanajuato. I began teaching Suzuki violin at the age of16, at the suggestion of my mother who was a Suzuki piano teacher. After 15 years of teaching I had never received any formal training. Thanks to the Oregon Suzuki Institute and a scholarship from the Community Music Center I was able to attend my first teacher training in Forest Grove, OR in June of 2003 and received training in Book II from Kathleen Spring, an incredible instructor and human being. She shared with me her Suzuki Journal announcing the I Suzuki Festival in Guanajuato, Mexico. Through our conversations of my Mexican American background, we had searched through the current issue of the Suzuki Journal for a sign of Suzuki in Mexico. 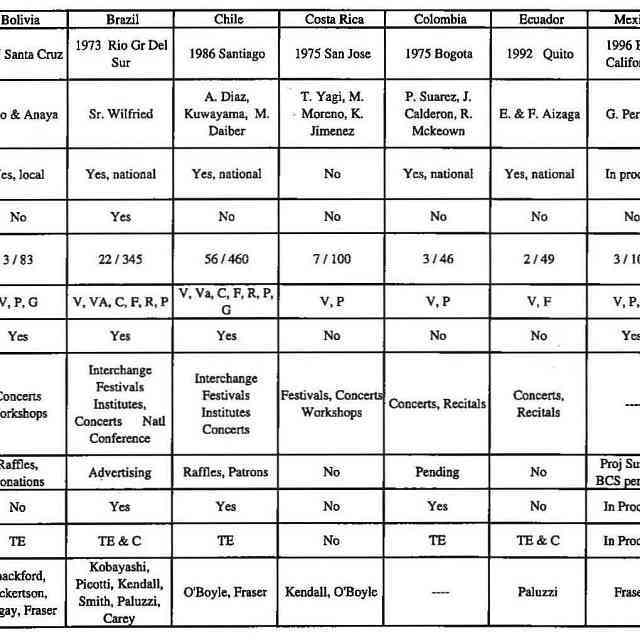 T my surprise the American Suzuki Journal had listings of Suzuki Festivals in Columbia, Brazil, Argentina, El Salvador, and Peru. I began to think “Why not Mexico?” With this question still lingering in my head we both caught eye of the Suzuki Festival in Guanajuato, Mexico. I knew in that instance that I had to attend. I began scraping my funds together, playing in the local bakery, and streets, borrowing from my mother and applying yet again for a scholarship from the Community Music Center. Through Kathleen’s encouragement and mentoring, I decided to begin my training to become a certified Suzuki teacher by attending the festival in Mexico. During the 10-day festival I met incredible musicians and parents filled with inspiration after learning of Dr. Suzuki’s life and philosophy. Watching young children in Mexico learning all the same repertory I had learned as a child brought tears to my eyes. Thanks to the organizer of the festival, Etna Demesne, I was allowed to share what my father had planted in me as a child; a love of music and pride in Mexico’s culture. At one of the final concerts, I performed “Satellite” (Little Star)” by a well-known Mexican composer Manuel M. Ponce, arranged by Paschal Hefts. Needless to say it was a moment 1would like to have shared with my father, but I know in my heart that he could hear me. Experiencing Suzuki training in Mexico brought many realities to light. 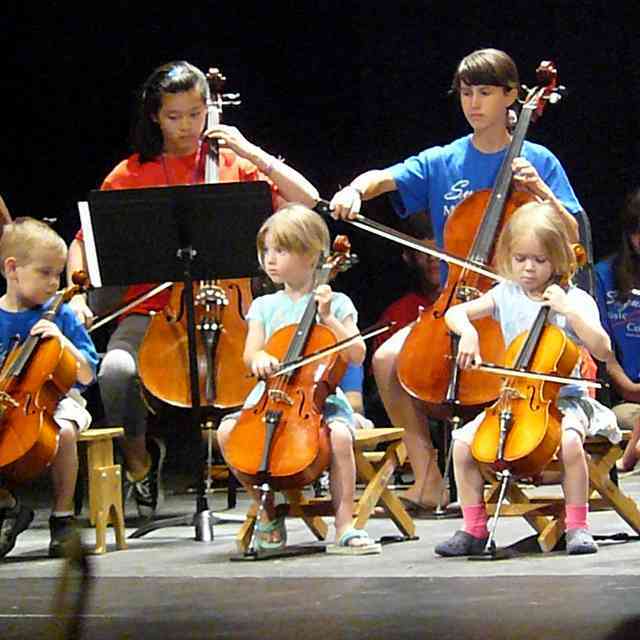 The Suzuki method is truly international and can be fundamentally taught in any language. Children are essentially the same in any country and learn quickly even with master teachers who do not speak Spanish. I also came to realize that there is a great need for more Spanish speaking teacher trainers and master teachers. I was amazed that even though the Suzuki method has been in some Latin American countries for more than 20 years there was only one master teacher who was Latin American and of the teacher trainers only one was fluent in Spanish, Caroline Fraser. Of course the Suzuki method has been in the US for 40 years and understandably there are more teachers and master teachers from the US. I found myself filling a need by constantly translating for the teacher training courses and master classes. The philosophy course taught by Ms. Fraser was an affirmation of the Suzuki training I had received as a child, but for some attendees in the class the mother tongue method was a challenging concept to grasp while others began to realize the potential of this method for children in Mexico to learn music. Mexico has an “old country” feel and mentality that carries into their musical training and while some watch in disbelief as video of the Suzuki tour group that included a four-year old playing the a minor Vivaldi concerto, others began to turn and look at the children present at the festival with new eyes. The violin lA & IB courses given by Carrie Reuning and Sandy Reuning were equally as fulfilling as the philosophy course and provided me with the opportunity to consider how I might teach Hispanic children in the US in their native language of Spanish. Now with my future unfolding before me I plan to continue my training as a Suzuki teacher and hope to complete my certification for teacher trainer status so that I may aid in filling the need for more fluent Spanish speaking teacher trainers of Latin American descent. I plan to attend the 2nd annual Suzuki Festival in Guanajuato, Mexico, in 2004 accompanied by a small group of my students from Portland, OR, so that they may experience the magic of the Suzuki method with children of a different culture, because music is truly an international language. In Santiago, Chile, the 4th Graduation Concert of violin, viola and cello took place with the participation of almost 200 students. This was a music marathon! Carlos Alberto Vieira and Katarina Grubisic Vieira who had traveled from Florianopolis, Brazil, to participate, joined the Chilean teachers Fernando Arevalo, Pablo Araya, Rigoberto Jara, Rene Santibanez, Alexis Alvarez and Paquita Munoz. Warm congratulations to Fernando Arevalo for his vision and for the fine organization of this event. Eduardo Luduena and Andrea Espinzo from Buenos Aires, Argentina also attended the 2003 Suzuki Festival in Lima, Peru as scholarship recipients. They returned to Buenos Aires, formed their Suzuki Association and immediately started working towards the 1st Suzuki Festival of Buenos Aires, which took place in October and was a resounding success. The philosophy course was full two months before the course began with 60 teachers registered and many others left out and disappointed. Congratulations to the organizers of this festival who, in spite of the current economic crisis in their country, were able to provide this wonderful and unforgettable opportunity for the children and teachers of Argentina through their determination, persistency and profound belief in the Suzuki philosophy. 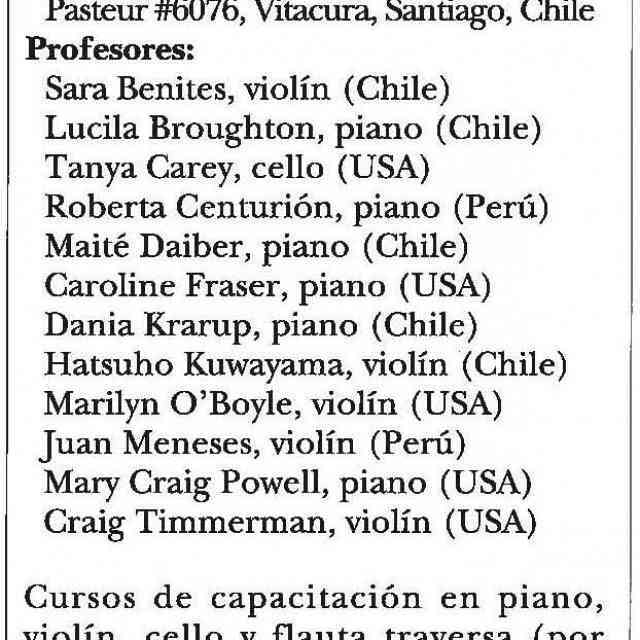 2003 has been a very positive year for the Suzuki Method in Argentina and especially in Buenos Aires. This feeling comes from two wonderful experiences: The Suzuki Association of Buenos Aires was formed with more than 20 teacher members in violin, cello, piano, voice and guitar. Our dream came true when we successfully organized the First Suzuki Festival ever in Buenos Aires. The festival’s format was similar to many other such events held throughout the Americas. Suzuki teachers and communities in the state and city of Buenos Aires had worked patiently for many years and had wanted to be able to organize concerts, courses and festivals, and so we were very happy and eager to form our own Association! In this First Suzuki Festival, held from October 9-19, lA and Piano Book 2 courses were offered. 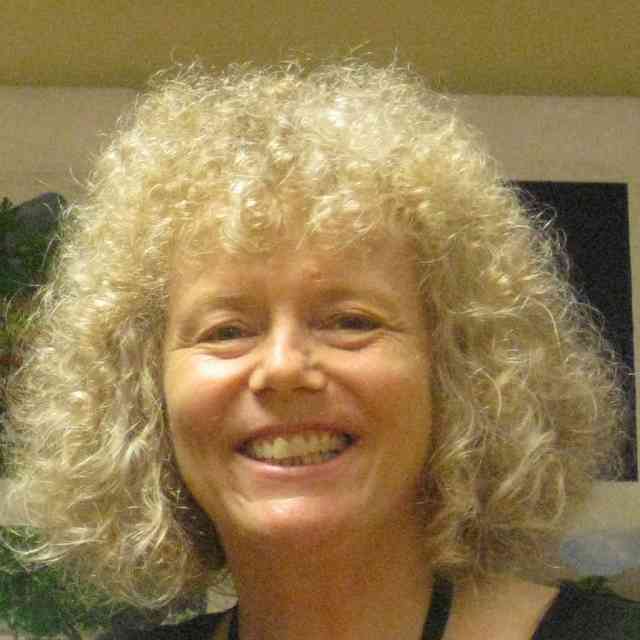 Prof. Caroline Fraser had sixty-one participants for the philosophy course and twelve for Piano Book 2. The participants traveled from all over the country! We also offered master classes and group lessons with fourteen Suzuki teachers of violin, voice, guitar, piano and cello. 140 students attended and performed in two final concerts. There was such interest throughout the country in the festival that we were receiving a huge amount of e-mail and faxes asking for information. After the Festival the response was incredible! Of course we are aware that such success does not happen overnight. It is the result of the seeds already spread by such people as Magdalena Cano and Sonia Vernaz in Cordoba, Graciela Vides in La Plata, and Ana’ Marfa Wilde in Tucuman, all of whom had organized teacher training courses in the past. Now we are seeing a very special situation m Argentina: in every program started at any music school or conservatory in the country, the word “Suzuki” (and its wonderful philosophy) appears as the most natural way to approach music. I think that we couldn’t have better news! Lots of work lies ahead, and it is rewarding and meaningful when we try to give the children our best here in the South! Eduardo Luduena began violin study as a Suzuki student at age four in Cordoba. He is now living in Buenos Aires, performs at the Buenos Aires Philharmonic and often appears as a chamber musician and recitalist. The President of the Suzuki Association of Beunos Aires, he has been teaching violin for 14 years and joined the Group of Suzuki teachers of Buenos Aires to organize and spread the Suzuki philosophy. Previously printed in American Suzuki Journal 32.2. Reprinted with permission. 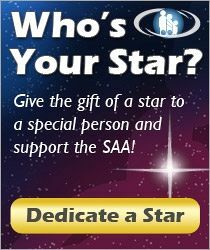 Copyright © 2004 Suzuki Association of the Americas, Inc.